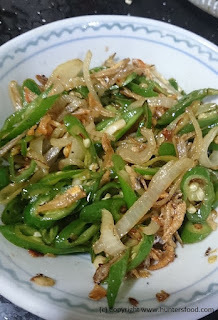 When I first came to Miri, I was very surprised to find that the young chillies (green chillies) were being treated as vegetables dish, and not as a heat element, condiment or garnish. It can be found at the tamu, ready-cut a longish-side and sold at RM2 per plate. I had an excess of big chillies that I planted at my backyard last month, so I harvest them young and made this. This dish is very common among the Orang Ulu's, and can be found at their restaurants around Miri. This is a 3-ingredient dish that is so easy to be made, can be whipped out anytime. 1. Wash anchovies and drain. 2. 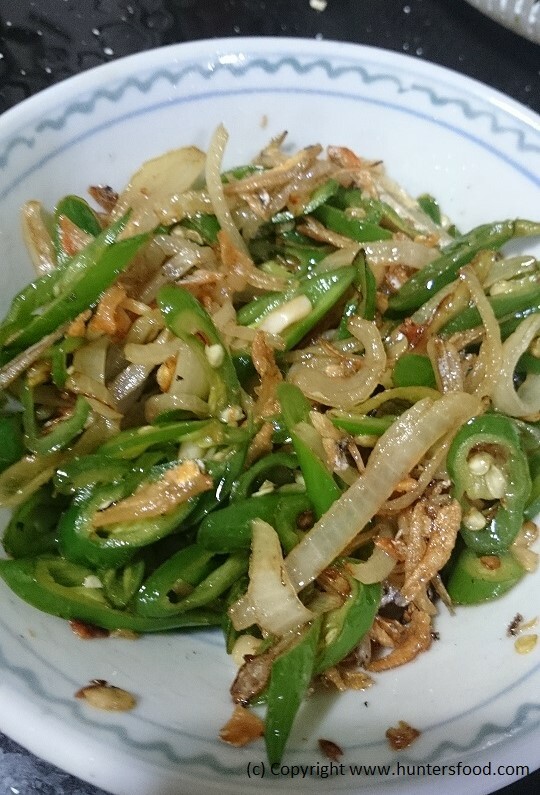 Cut onion and green chillies. In my photo I cut it short -sideways. Deseed if needed. 3. Heat up oil and fried anchovies until crispy. Put aside. 4. Using the same oil, saute onion until fragrant. Move to one side of the wok. 5. Add in chillies. Saute until fragrant and soften. Toss with onion evenly. 6. Turn off heat. Add the anchovies in the wok and toss lightly.